What better way to spend the one gloriously sunny day of a brutal British summer than indoors manfully wading through a thousand pours of Chile’s and Argentina’s vinous best? 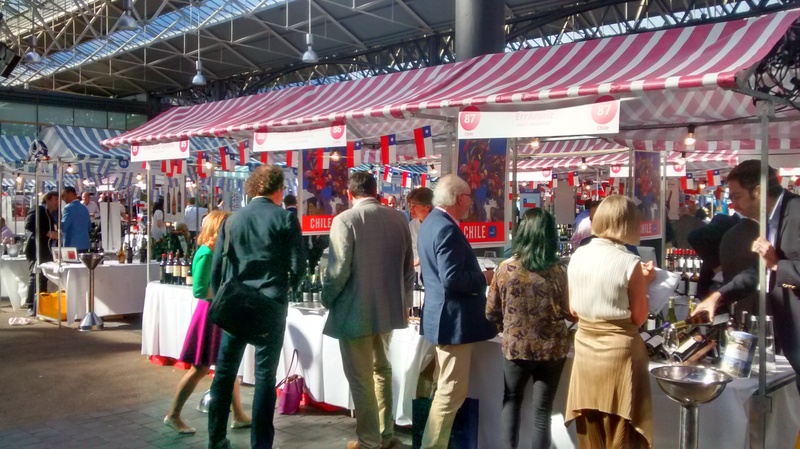 Mercado Andino wine fair at the appropriately named Old Spitafields Market, London. I too was stumped so nosed toward Mercado Andina, Europe’s largest South American wine trade event, for six and a half hours of sniffing, swirling and sorrowful spitting. The Old Spitalfields Market must be among the best venues (and most aptly named) for such a jamboree, the sunlight dappling in through the old iron fretwork stoking the convivial buzz among the stalls below and adding to the air of a vendimia fiesta. Given the enormity of the task in front of me (and a first terrifying sniff and discard of a jet-black monster), I resolve to attempt the day without a drop of Malbec or either Sauvignon passing my lips; tasting the unordinary in search of the extraordinary; to try to get a feel for what’s cooking outside the mainstream with less planted varieties – the classic and arcane, indigenous and alien, from either side of the Cordillera. First up: Argentina and a pair of radically different rosés. Typically, I fail my mission at first sip. 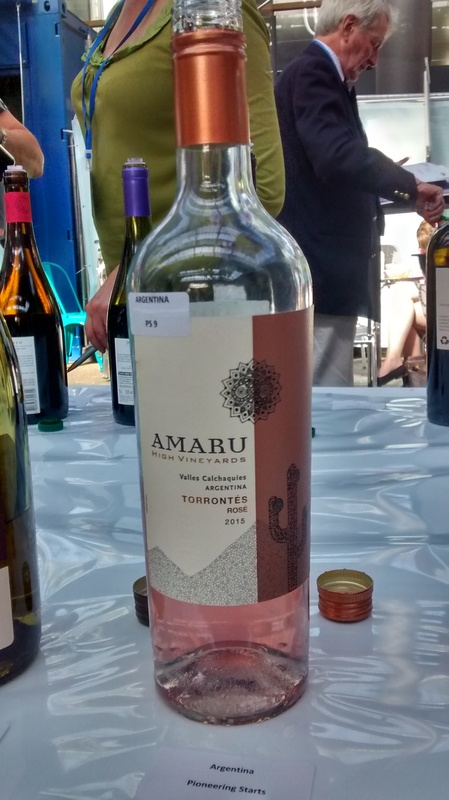 The Amaru High Vineyards Torrentés Rosé 2015, El Esteco, Valles Calchaquíes gains its vivid hue not from the Calchaquí vineyards being closer to the sun than any other, but a little matter of five percent Malbec in the blend. Rats. This is a lovely drop, bright sweet red berry fruit with a little watermelon twang to keep it fresh; interesting enough to both justify the £9 tariff and drink into the northern hemisphere autumn. Breva Syrah Rosé 2015, Alpamanta. 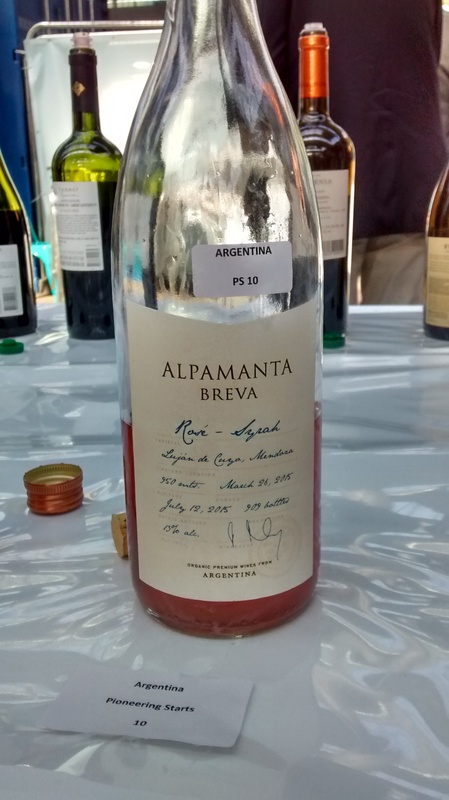 Quite a contrast to one of the (surprisingly given the current vogue elsewhere) few natural wines on show: Breva Syrah Rosé 2015, Alpamanta Estate, Luján de Cuyo (unreleased) was bottled 11,500 km away, one kilometre up and 57 days ago. Unsurprisingly it’s wild – a rush of boiled red fruits, herbs and smoky plasticky things wired on zinging acidity but the components, while currently out of whack, are in proportion and this should be a very cool wine in a few months. With my palate well and truly shocked awake, I was delighted to spy Susana Balbo’s stand, her Crios wines being a staple of my sojourn in Buenos Aires some years ago. Happily the Crios Torrontés 2015, Susana Balbo, Cafayate is its usual cheerful self; peppy, citrus and elderfloral with a smokily herbal lick of intrigue. The contrast with the Signature Torrontés 2014, Uco Valley is like chalk and cheese. In fact, it’s as if someone whacked a barrel of chalk and cheese into the Crios! A stark demonstration of what barrel fermentation (three months here) can do to an aromatic wine; this is a wide wild beast throwing off sweat and salt and peat smoke. A textured mouthful too with an almost cheesy savoury twang to the ripe grapefruit and apricot fruit and well concealed seafood-hungry acids. It’s liquid tapas – a vinous boquerone! But in a good way. And primes me nicely for the first red of the day – or is it? 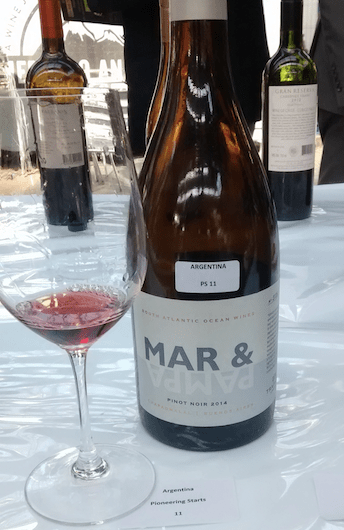 Mar y Pampa Pinot Noir 2014. I have to admit I could never have guessed Mar y Pampa Pinot Noir 2014, Chapadmalal, Bodegas Trapiche was a Trapiche Pinot Noir. From vineyards just south of Mar del Plata and four km inland, it’s a delicate salmon pink with an orange tinge, and so vivid on the nose it hits like a struck match but pleasantly – sweet cranberry/bitter wild strawberry fumes melting with just-tamed acid and coating the mouth in red juicy savour. Really a mad abandoned rush of a wine, lost in a dance with herself, blissfully unconcerned at her underskirts showing. Nature made this. A refreshing shade under 12% alcohol, it will go for about £12. It’s grand: drink a little chilled with anything you feel like eating or better yet, skip the food and just have a big breakfast tomorrow. A tad more conventional but no less interesting, Gran Dante Bonarda 2013, Dante Robino, Luján de Cuyo/Santa Rosa bursts out of the glass with crimson berries, violets and sandalwood. This chap has clearly had a prestigious upbringing but remains a down-to-earth sort. He makes a grand broad splash of strawberry, cedar, tobacco and medicine cabinet with great grip and a long undertow of velvet tannin. Very sensual wine and so well handled; so many of these ‘premium’ bottlings today have been tiring – over-extracted or overdressed; but here 14 days of post fermentation soak and 12 months’ new American oak are no more than the fruit demanded. Chapeau! I strike out in search of Syrah and, after enquiring at a disappointing number of stalls, finally hear a booming yes. The source: man mountain, true-religious winemaker and all-round good egg Mauricio Lorca. As he poured through three levels of his Syrah, I was struck, as with the Dante Bonarda, by how these wines (as so often seems to happen) weren’t wrangled to fit a style and price point but actually needed to be made. Lorca Fantasia Syrah 2014, Uco Valley is classic in the Northern Rhône accent, spicy raspberries on the snout and in the mouth, all about the fruit with minimal old oak: it’s a ringer for a cheerful St. Joseph. 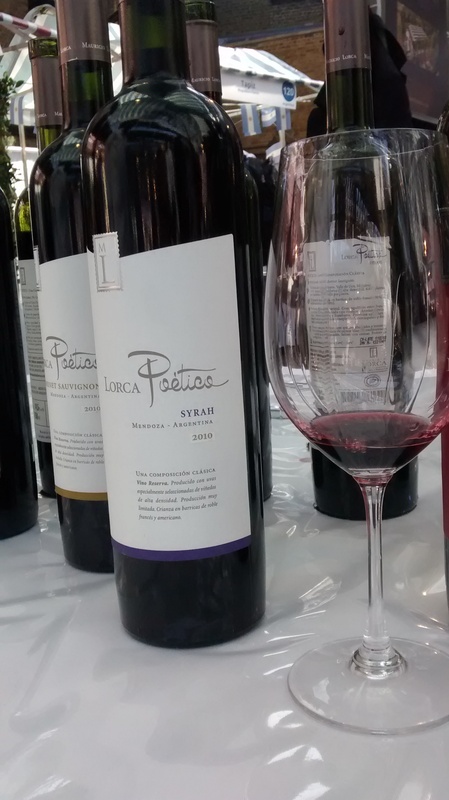 The Poetico Syrah 2010 is in the same key but broader and multifaceted, slowly developing but still all lush primary fruit. With 50% Malbec and Cabernet joining the Syrah, I initially tried to duck the Inspirado Blend 2009; but Mauricio is a lot bigger than me so I caved. It’s magnificent, every red and dark fruit you can name macerated with incense and exotic woods and leather and mint and tobacco, invisible but huge acidity and alcohol and the highest climbing gum-coating tannins I’ve ever experienced melting magically away as the finish descends. Monstrous yet fresh. The unique thing that shines through is the perfectionism behind these wines – you can almost taste the mortal fear of a man who still hasn’t quite convinced his mother it was a good idea to quit medical school for oenology! Finca Piedra Infinita Malbec 2012*. 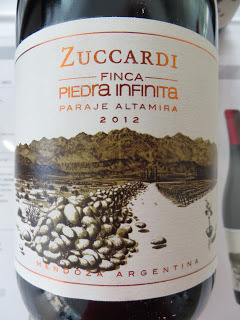 With a wisp of violet in the Inspirado whetting my appetite I finally returned to the earlier spurned Finca Piedra Infinita Malbec, 2012, Familia Zuccardi, Uco Valley and happily found a much more well-mannered beast than expected. This is what low yields from cruel soil at high altitude can do – it’s fresh and mineral driven, crystal-clear blackberry and redcurrant and graphite and spice. It’s all texture – it sits on your tongue for a beat or two then slowly remembers it’s a wine and runnels underbrush herbal red fruits, tomato leaves, tobacco and clay to every corner of the mouth, echoing Etna and Vulture, miraculously exhaling its 15.4% alcohol with barely a trace. Pure, deeply cool wine. I was chuffed to see Argentina show so well since my last immersion in her wines: the old stalwarts are keeping pace with daring newcomers and the range of flavours, styles and sensations can only get more exciting with so much talent burgeoning among the vines and in the winery. Let’s find out if Chile’s keeping pace while dodging the dreaded Sauvignons…..
Stay tuned for part two – sampling Chile’s wares at Mercado Andino. Half-man, half-decanter. After a decade of poker-funded exploration of the vinous heights of Italy, Burgundy and the Rhone, followed by a year learning web development, I'm taking the first steps toward making this incredible stuff we call wine. I'm hoping to taste widely, spew forth horribly verbose tasting notes and meet as many wonderful wine folk as I can.